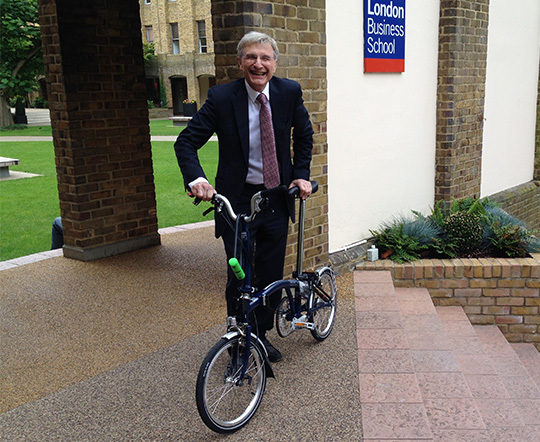 I’m another enthusiast for those classic British folding bikes, the Brompton. I’ve clearly had mine for a long time, here’s a comparison between my Brompton and two other bikes in my small collection, from nine years ago. 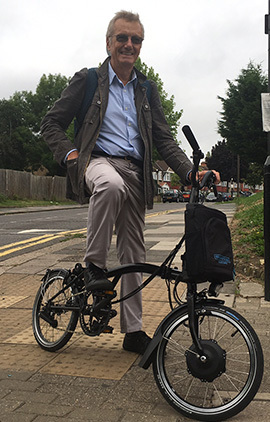 The other day I went for a ride on a new Brompton – an electric one – with Simon Calder, England’s favourite travel journalist and my co-driver through Kazakhstan, Kyrgyzstan and Uzbekistan on my recent Silk Road by MGB odyssey. Simon posted a story on our electric Brompton ride and I was convinced enough to put down a holding deposit for delivery when they commence real production in 2018. It’s a bit like an advance order on a Tesla! The electric Brompton will cost around £2500 when it goes on sale, so it won’t be a cheap electric bike, but hey, it does have front-wheel-drive and that’s pretty unusual for a bicycle. ▲ Afterwards with Will Butler-Adams, Brompton’s energetic CEO who’d just taken us for a ‘follow me’ ride around the neighbourhood, we watched new Bromptons come off the assembly line. 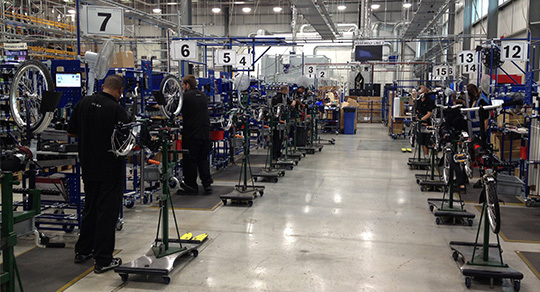 Today Brompton is Britain’s biggest bicycle manufacturer, turning out 50,000 fold-up marvels a year. 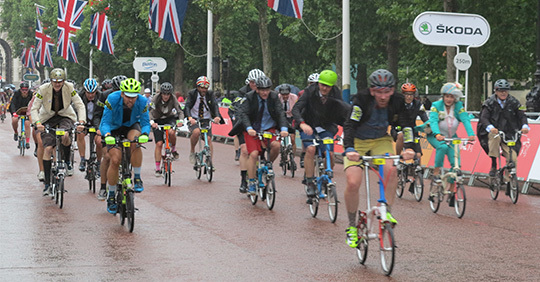 A few days later I was beside The Mall – the historic boulevard leading to Buckingham Palace in London – to watch the Brompton World Championships: 500+ Brompton riders racing eight laps of the weekend cycling circuit. ▲ The procedure is a little different to most bike races. No lycra, silly outfits are required, for men a jacket and tie is de rigeur. Your Bromptons are lined up on one side of the road – folded up of course – and you have to run across the road and unfold it before you start riding. ▲ Pouring rain didn’t help, but the leading peloton was overtaking tail-enders (particularly anyone who had trouble unfolding their bike) within a lap or two and the speedy riders were pushing the leading motorcycle all the way.